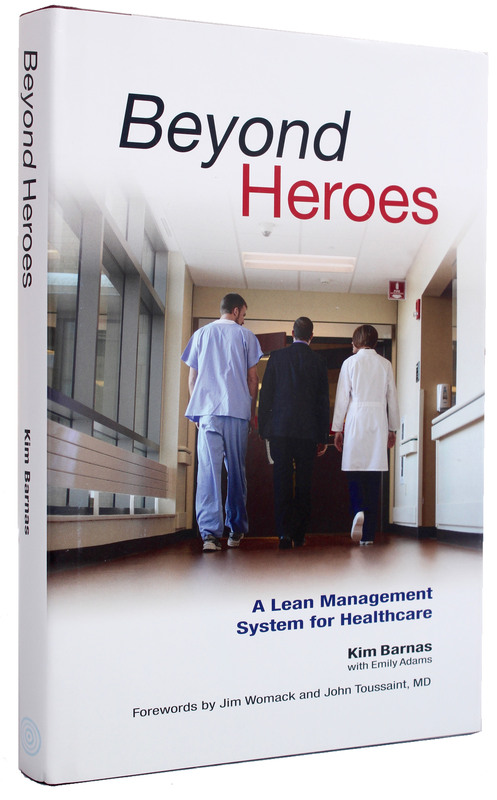 Beyond Heroes: A Lean Management System for Healthcare by healthcare management leader Kim Barnas is the story of an organization that extended the culture of excellence from solitary individuals to an entire healthcare system. Hospitals have long relied on the heroics of brilliant nurses or doctors acting alone to save the day. Such heroics often result in temporary workarounds and quick fixes that leave not only patients and quality care at risk but also increase costs. Like a growing number of healthcare organizations around the world, ThedaCare used lean thinking and the principles of the Toyota Production System to improve the quality of care, reduce waste, and become more reliable. The core work of this transformation involved changing the culture, including how individuals at all levels responded to problems, thought about patients, and interacted with one another. Whereas lean thinking was incompatible with ThedaCare’s old top-down, hero-based system of management, Barnas, during her tenure as senior vice president of ThedaCare, worked with a team of people to create a lean, stable management system to spur continuous improvement. In addition to exploring the eight essential components of the lean system, Barnas introduces four executives from healthcare systems across North America who have implemented ThedaCare’s system, sharing the lessons they learned along the way. Every healthcare system in the United States should master the ideas in this book and practice them every day. If they did, we would see a revolutionary improvement in medical care outcomes and massive cost reductions. Beyond Heroes is a practical and helpful guide for all leaders in healthcare. It fills a wide gap in the lean literature, and offers applicable steps for leaders no matter where they are in their improvement journey. If you are in the midst of a lean transformation in any industry you must read this book! … Kim is a natural story teller and we feel the struggles, resolution, and great joys of success! Beyond Heroes outlines the leadership system necessary to achieve dramatic improvements in healthcare. … This book will help shape the healthcare leaders of tomorrow. Beyond Heroes…. serves as a tremendously instructive guidebook on deployment of a Lean Management System as it demystifies abstract concepts through practical approaches, guidance, and real world examples. Lean success is critically dependent upon leadership developing a different approach to leading, one that is consistent with the principals/practices/and values of lean. Kim Barnas demonstrates exactly how to do that in Beyond Heroes. This book is essential reading for every executive who wishes to strengthen their lean transformation. It is deceptively simple, and amazingly powerful: respect and invest in your managers by creating a system that both sustains the gains of lean AND coaches managers to lead in a new way. Without the management system, lean is just another healthcare fad. Thank you Kim for creating such a great book! Clear, concise and practical you help any serious reader easily grasp many fundamental concepts and then, suggest possible implementation strategies. I took away more than 20 ‘pearls of wisdom’. A rare occurrence in one book, for which I am in your debt. Congratulations! Many people talk about lean management, but Kim Barnas is one of the few who have actually built a robust lean management system in healthcare. Beyond Heroes will be immeasurably useful to organizations that are looking to move beyond tools and projects to a culture that creates the best patient care and a far better workplace for healthcare professionals. This book is full of impactful stories and meaningful, practical advice that is grounded in the realities of healthcare, while making real the potential that every organization should be achieving. I’d strongly recommend this book to every healthcare leader – read it, talk about it, and put in the hard work required to make these meaningful changes happen. Beyond Heroes hits that rare sweet spot between theory and case reports. This book is a clear path to high performance guided by well tested system design suggestions and illustrated by practical examples for the front lines. Readable, understandable, and if followed, transformational. 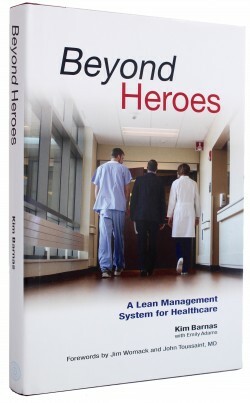 Beyond Heroes, A Lean Management System for Healthcare, should be required reading for any healthcare leader who has begun or is thinking of beginning the lean journey. Kim Barnas has done an excellent job of describing ThedaCare’s business performance system – the secret sauce that has helped make ThedaCare so successful. This book will be a valuable guide and resource for years to come. I just finished the book “Beyond Heroes” and really enjoyed it. I had read David Mann’s book “Creating A Lean Culture” which stressed the importance of standard work. Having now read your book I have a much deeper understanding of what I need to do in order to make my leader standard work more effective. I thought Beyond Heroes did a great job of laying out the “system” or “infrastructure” that needs to be put in place to make lean really effective and part of the company culture. I wish I had read it earlier. I guess I worried the book would have too much about health care specific issues and not be applicable to my finance department. Then I realized that most of the books I read about lean are based on industries (like TPS and cars) that have nothing to do with my finance department. When I was looking for something that talked about the nitty gritty of managing a lean system, Beyond Heroes looked the best and I’m glad I read it. I’ll recommend it to others. Learn from 11 organizations that transformed to a culture of care centered on the patient’s well-being through operational excellence.